The pennywhistle — also known as the penny whistle or tin whistle — is a member of the flute family. The flute is among the earliest instruments known to humankind. A fragment of an animal-bone flute discovered in a cave in Slovenia is believed to be at least 43,000 years old. It is not known how this prehistoric Slovenian flute was blown, but different types of flutes with distinct blowing methods evolved over time: the side-blown or transverse flute; the end-blown flute; the notch flute; and the duct flute. The pennywhistle belongs to the duct-flute branch of the flute family. Duct flutes have a mouthpiece similar to that of an ordinary whistle. The mouthpiece directs the player’s breath onto a cutting edge that produces sound. Thanks to this mouthpiece, the duct flute does not require any special blowing technique. It is the easiest type of flute to play. The best-known example of the duct flute is the eight-holed recorder, which dates from around the 14th century. The six-holed flageolet is a close relative of the recorder, but is probably an older instrument. Both the recorder and the flageolet were most often made of wood. In the last decades of the 18th century, British artisans developed a process that made tinplate more readily and cheaply available. This paved the way for the mass production of tin-plated items of every description, including an inexpensive substitute for the wooden flageolet. The new tin flageolet was made by piercing holes in a sheet of tin-plated steel, rolling the tinplate around a form called a mandrel, soldering the seam where the edges of the tinplate joined, and partially closing one end of the tube with a wooden plug to form a mouthpiece. The instrument became known as the tin whistle or the pennywhistle. It is thought to have sold for a penny in the early 19th century. Wages were very low in that era, so while the instrument was always affordable, it was not as inexpensive as its nickname would seem to indicate. Mass-produced brass flageolets with lead end-plugs also began to appear in the 19th century. By the mid-20th century a plastic mouthpiece replaced the lead plug. The pennywhistle in its various forms has been widely played by children and adults from the early 19th century to modern times. Though the pennywhistle is closely associated with Irish or Celtic music, many different styles of music can be and have been played on this versatile instrument. The kwela style, which flourished in South Africa in the mid-20th century and is undergoing a revival, is a prime example of this. 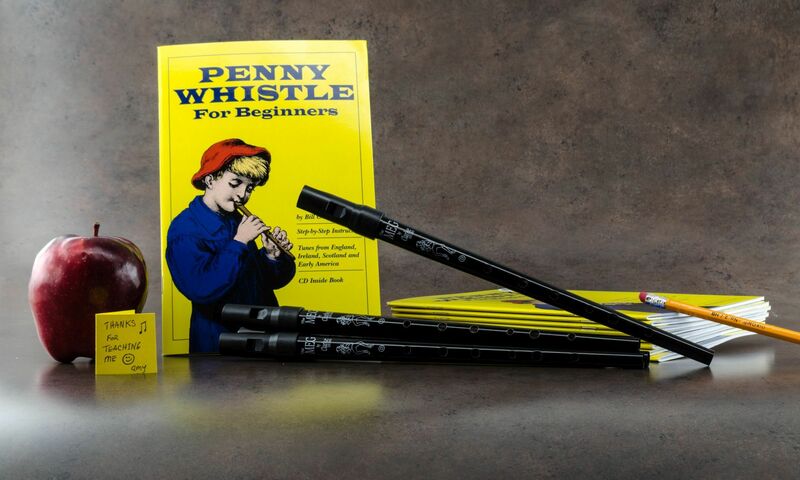 See our video page for examples of pennywhistle music in a variety of styles.